T he 26th N.C. Field Music strives to accurately portray the musicians of the War Between the States, playing authentic rope-tension drums and six-holed fifes. The members of the Field Music function as a true military Field Music should function both in camp and on the field. Unlike brass bands of the period used primarily for special occasions, the fifes and drums were considered an essential part of the infantry. 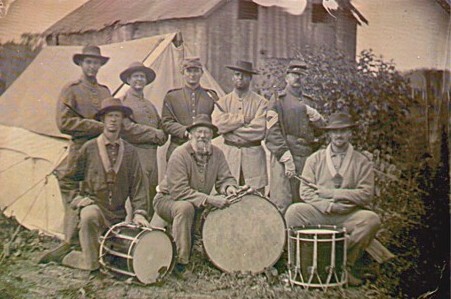 The field music was responsible for playing the "camp duty" calls, such as reveille and dinner calls, as well as keeping a steady cadence with uplifting tunes while the army was on the march. Contrary to the popular Hollywood image, most musicians were not "little drummer boys", but were actually regular military age. These men were expected to know what they were doing and had to demonstrate a high level of musical knowledge. As reenactors, the current musicians of the 26th N.C. play camp duties and marching tunes straight from the music books of the period. The group prides itself in being one of the most authentic in the hobby, both in musical sound and military decorum. There is always an opening for new members who have sufficient musical aptitude and an interest in learning this historic style of music. Our current members range in age from the twenties to the fifties. While the field music accepts members under the age of sixteen, all members must demonstrate a commitment to the performance of the music and must meet the group’s basic musical knowledge requirements. Also available are the group’s CDs, "Music on the March" & the new CD of The Carolina Fife and Drums "Go to the Devil & Shake Yourself", composed of various drum & fife tunes from the period. See the above link to their separate website for more information.